Join us in exploring the undiscovered, authentic and timeless destinations of Britain. Begin in London for some historical sightseeing before venturing on to Stonehenge for an up-close view of the mysterious stone formations. You’ll drive through magnificent scenery to Cornwall—a film location for the Poldark series. In Plymouth, see the Mayflower Steps where the Pilgrim Fathers embarked for America in 1620. Cross the wild moorlands and deep river valleys into Dartmoor and maybe join the locals in a cozy tea room or a friendly pub in the village of Widecombe-in-the-Moor. Dip into history with a visit to Bath’s excavated Roman Baths, the grand socializing complex dating from 70AD. Stay overnight in the Welsh capital of Cardiff, and travel to the Cotswolds, taking in its picturesque villages and rolling hills on your way to Stratford-upon-Avon, historic home to William Shakespeare. Birthplace of Charles Darwin and one of England’s finest medieval towns, Shrewsbury is located in the glorious countryside near the Welsh border. Next, visit The Beatles Story in Liverpool, then travel further back in time to England’s Lake District aboard a steam railway train. From your carriage, savor the lovely views of the Levens Valley, and continue your journey on a Lake Windermere cruise to Bowness. On the way to Glasgow you’ll visit Gretna Green where the blacksmith was known to wed young runaway couples since the 1700s and still a popular wedding venue today. Follow the “bonnie banks” of Loch Lomond and the wild Rannoch Moor into the Scottish Highlands. Try to catch a glimpse of “Nessie” in Loch Ness and hear about the famous battle of Culloden before spending the night in Inverness, the beautiful Highland capital. See St. Andrews, home of golf and tour Edinburgh Castle to admire the Scottish Crown Jewels. Specific departures of our escorted tour of Britain include the world-renowned Military Tattoo performed on the castle’s esplanade in a mass spectacle of Scottish pipe bands, music, dance, and pageantry by performers from around the world! From Edinburgh, travel to London via express train to find your Local Host ready with the assistance you need to enjoy the best of London. Welcome to London! Uniformed Globus Hosts will be waiting to welcome you. The afternoon is at your leisure. 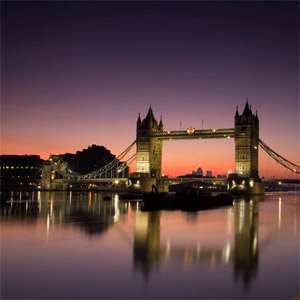 For a first experience of London, you might like to join our optional Taste of London excursion with dinner, followed by a guided illumination cruise on the Thames River. Start your day with a walking tour past some of London’s most remarkable landmarks. Your Local Guide will bring you to Parliament Square where you’ll see the Houses of Parliament and Big Ben, Westminster Abbey and the Church of St. Margaret’s—all part of a UNESCO World Heritage Site. Then, take photographs of the various famous statesmen who oversee the comings and goings of today’s politicians: Sir Winston Churchill, Abraham Lincoln, Mahatma Gandhi, Nelson Mandela, just to name a few; and of Millicent Garrett Fawcett, a leading suffragist who campaigned tirelessly for women’s rights. Your guide will then lead you to the CHURCHILL WAR ROOMS, the underground bunker that housed Winston Churchill’s center of operations during World War II. This afternoon, why not to join an optional excursion to the Tower of London with its fabulous Crown Jewels. Meet your Tour Director and traveling companions and depart at 8 am for a memorable day of sightseeing. First, travel to prehistoric STONEHENGE; explore the visitor center with its imaginative exhibitions, before admiring the magnificence of the monument up close. Then, enjoy LUNCH at a local pub before heading to Exeter where you will spend the next two nights. There is time to discover this small but vibrant city in the heart of Devon on your own. Enjoy magnificent scenery today as you drive to Cornwall, of Poldark fame, and to the pretty fishing village and former smuggler’s port of Looe. In Plymouth, see the historic Barbican and the Mayflower Steps, where the Pilgrim Fathers embarked in 1620. Then, head into Dartmoor, famous for the wild, open moorlands and deep river valleys, rich history and rare wildlife. Stop in Widecombe-in-the-Moor with its prominent church, cozy tea rooms, and lively pubs before returning to Exeter. This morning, travel to elegant Bath to see the amazing excavations of the ROMAN BATHS. Constructed in around 70AD as a grand bathing and socializing complex, this is one of the best-preserved Roman remains in the world. After the visit, you will have time to explore the town on your own and marvel at the honey-colored Georgian architecture. Stay the night in Cardiff, the Welsh capital. 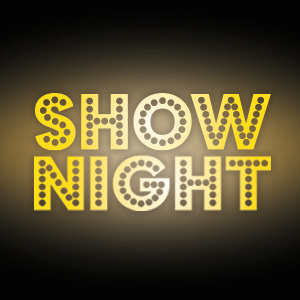 You might want to join an evening of Welsh entertainment and dinner tonight. Start your day with a visit to Tintern, the stunning home to a famous Cistercian abbey, set in the beautiful Wye Valley. 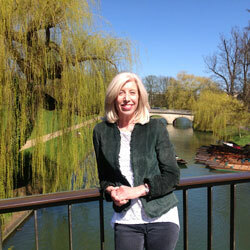 Continue to the Cotswolds with its picturesque villages and idyllic rolling English landscapes. Stop in Broadway before making your way to Stratford-upon-Avon, where your Tour Director will take you on a walking tour ending at SHAKESPEARE’S SCHOOLROOM. It was here that William was educated and inspired to become one of the world’s greatest playwrights. Travel back in time in England’s Lake District as you climb aboard the LAKESIDE & HAVERTHWAITE RAILWAY STEAM TRAIN and enjoy beautiful views of the Levens Valley from your carriage. Continue your journey aboard a WINDERMERE STEAMER to Bowness and take in the wooded shoreline and distant stretches of the high moorland. On your way to Glasgow for your overnight stay, stop in Gretna Green, where the blacksmith would wed runaway couples. Follow the “Bonnie Banks” of Loch Lomond and head through wild Rannoch Moor into the Highlands. Via haunting Glen Coe, reach Fort William beneath Ben Nevis. Then, travel along Loch Lochy, Loch Oich, and Loch Ness of ‘Nessie’ fame to the CULLODEN VISITOR CENTRE. Hear the story of the crushing Hanoverian victory over Bonnie Prince Charlie’s Scottish clans. Overnight is in the Highlands capital, Inverness. Enjoy beautiful vistas of the Cairngroms National Park on your way to the Victorian mountain resort of Pitlochry. Then to St. Andrews, home of golf and a famous university town, and over the elegant Forth Road Bridge to Edinburgh. Tonight, you might like to join an optional Scottish evening with Highland dancers, bagpipers, and the Ceremony of the Haggis. Join your Local Guide on a walking tour along the famous Royal Mile. On the way, discover Edinburgh’s deepest secret, THE REAL MARY KING’S CLOSE, a warren of hidden streets frozen in time since the 17th Century. Your tour will finish at EDINBURGH CASTLE to admire Scotland’s Crown Jewels. The afternoon is free to enjoy the Scottish capital at your own pace. 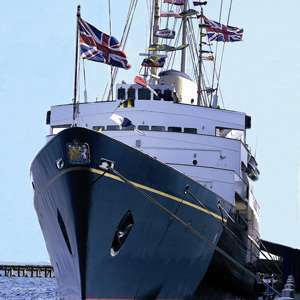 Later, a unique optional experience: board the former Royal Yacht Britannia, once the perfect royal residence for glittering state visits and family holidays. Tour five decks and see how the Royal Family and crew of 240 lived and worked on board. Dinner rounds off this optional evening. For departure numbers July 27 andAugust 10, tickets are included for tonight’s performance of the world-renowned MILITARY TATTOO. 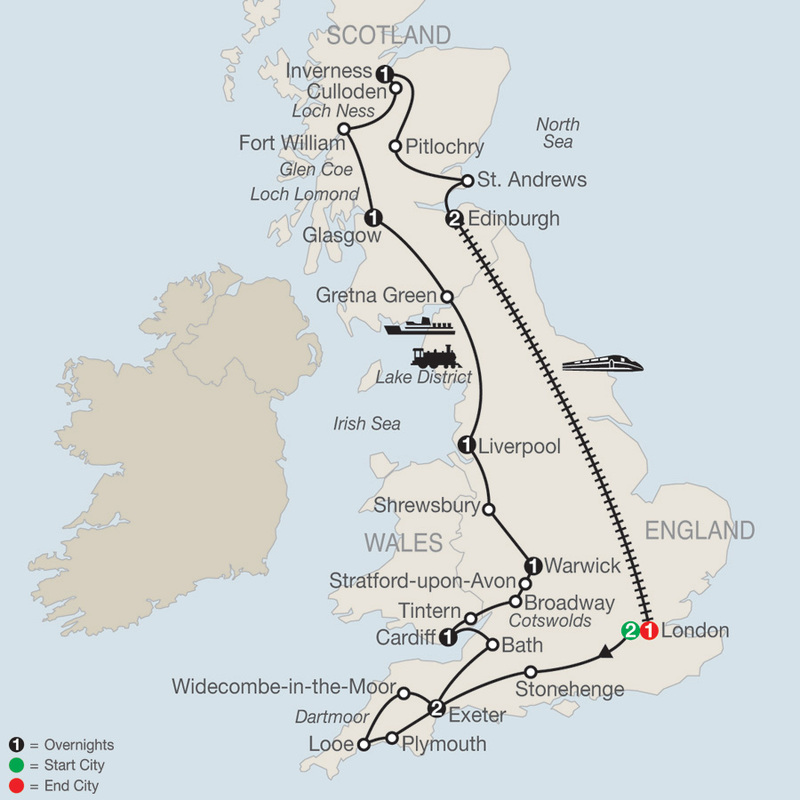 Travel by EXPRESS TRAIN (first-class) to London. Your Local Host is available to help you make the most of your stay. A traditional dining experience followed by a nighttime cruise along the Thames River, viewing some of the capital's most beautiful illuminated sights. 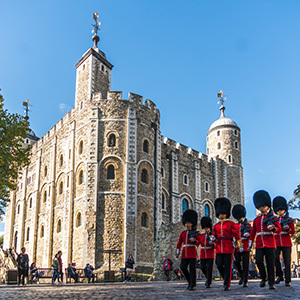 From the opulent Crown Jewels to the uniformed Beefeaters and infamous ravens, this fascinating excursion introduces you to the Tower of London, one of the country's most famous castle fortresses. A wonderful escorted evening in London's theater district starts with a delicious dinner, followed by excellent seats at your chosen show. 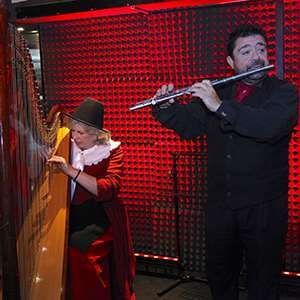 Experience Welsh culture at its finest during this delightful evening of food, wine, and traditional entertainment. 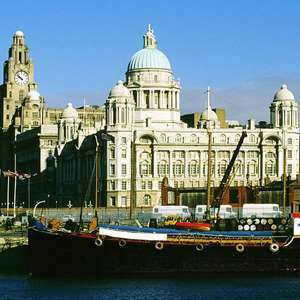 Enjoy a detailed introduction to the splendid city of Liverpool on this entertaining private guided tour. Along the way, visit the magnificent cathedral, admire stunning historic civic buildings, hear about the legendary Beatles, and discover the city's glorious maritime history. 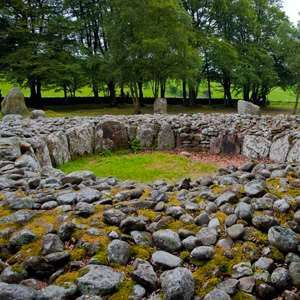 A rare opportunity to view without restrictions 4,000 year old Neolithic burial chambers and standing stones, marvelling at the accuracy of their placing and role in ancient life. Then, enjoy a drink at a local pub. 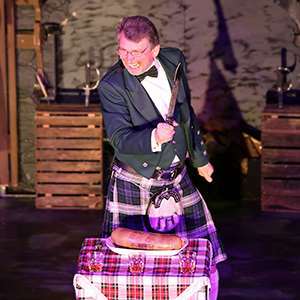 No visit to Scotland's capital city would be complete without joining a Scottish evening with dinner, wine and a show featuring singers, dancers, bagpipers and the Ceremony of the Haggis. Enjoy a visit to the former Royal Yacht Britannia, which was used on over 700 overseas visits and sailed over a million nautical miles, and discover what life was like on board Her Majesty's floating residence. Later dinner with wine and coffee at an excellent local restaurant is included. * The "Starting at" or listed price is based on the lowest price available to book. Price is per passenger based on double occupancy and does not include airfare; additional fees/charges are not included. If a price is crossed out, the new price shown includes a limited time promotional offer(s) – please review current promotions or deals for additional information. Some tours require intra-vacation flights (and in some cases intra-vacation segments must be purchased from Globus).